UNDATED - For the week ending Sunday, showers and thunderstorms brought much needed precipitation to the State, according to the USDA's National Agricultural Statistics Service. Last week's rain, along with cooler temperatures, provided some drought relief to portions of South Dakota. However, rainfall totals varied widely, leaving some locations with little to no precipitation. Moisture conditions remained short to very short for a majority of the State. There were 5.6 days suitable for fieldwork. Topsoil moisture supplies rated 25 percent very short, 41 short, 34 adequate, and 0 surplus. Subsoil moisture supplies rated 34 percent very short, 41 short, 25 adequate, and 0 surplus. Winter wheat harvested was 95 percent, near 93 last year, and ahead of 89 for the five-year average. Spring wheat mature was 96 percent. Harvested was 79 percent, near 82 last year, but well ahead of 59 average. Oats mature was 95 percent. Harvested was 80 percent, behind 94 last year, and near 83 average. Barley condition rated 56 percent very poor, 26 poor, 18 fair, 0 good, and 0 excellent. Barley mature was 83 percent, ahead of 77 last year, and near 80 average. Harvested was 30 percent, well behind 72 last year. Corn condition rated 10 percent very poor, 21 poor, 35 fair, 33 good, and 1 excellent. 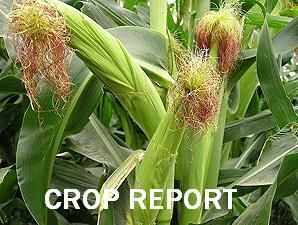 Corn silking was 96 percent, equal to last year, and near 97 average. Dough was 45 percent, well behind 66 last year, and behind 57 average. Dented was 4 percent, near 7 last year and 8 average. Soybean condition rated 6 percent very poor, 16 poor, 44 fair, 31 good, and 3 excellent. Soybeans blooming was 95 percent, near 97 last year, and equal to average. Setting pods was 82 percent, behind 87 last year, but ahead of 76 average. Dropping leaves was 1 percent, near 0 last year and 1 average. Sorghum condition rated 14 percent very poor, 24 poor, 56 fair, 6 good, and 0 excellent. Sorghum headed was 73 percent, behind 90 last year and 86 average. Coloring was 14 percent, behind 25 last year and 19 average. Mature was 2 percent. Sunflower condition rated 10 percent very poor, 22 poor, 58 fair, 10 good, and 0 excellent. Sunflowers blooming was 64 percent, behind 69 last year, and near 67 average. Alfalfa condition rated 40 percent very poor, 39 poor, 15 fair, 6 good, and 0 excellent. Alfalfa second cutting was 66 percent complete, behind 74 last year and 84 average. Third cutting was 30 percent, behind 35 last year, but near 28 average. Pasture and range condition rated 34 percent very poor, 29 poor, 25 fair, 12 good, and 0 excellent. Stock water supplies rated 25 percent very short, 31 short, 43 adequate, and 1 surplus.